John Wells’s phonetic blog: uvular r : trill or fricative? Your impression concurs with mine in all points, for what it's worth. The trill is still sometimes considered the standard, but it's dying out. By the way, the Northern/Southern division one can often read is much too simplified. Stereotypical coastal German has a distinctive alveolar trill, and the Swabian dialect in the South has rhotacised vowels. It's more about marginal vs central, if at all. 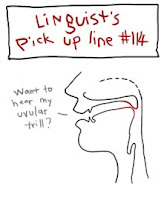 Fortunately, I didn't have difficulty learning a uvula trill and can produce it easily in most phonetic environments. But the majority of the Japanese learners of French and German that I have spoke to find a uvula trill more difficult to learn than a uvula fricative. I wonder if this has something to do with the length of the uvula. The longer your uvula is, the easier you find it to learn a trill?? I agree with John that learning a uvular fricative is much easier than producing a trill at the same place of articulation. With a trill there has to be a delicate balance between the degree of stricture and the force of the pulmonic airstream to make the velum vibrate. In the case of a fricative all you need is a narrow passage to achieve a friction. I've never had a problem with the trill, but I know a lot of people who do. My wife, who has several German friends, regularly asks me to produce it, but has yet to imitate it properly (though she has no problem with lateral fricatives, uvular ejectives, or ejective alveolar trills). It could be that, as Shige says, it has something to do with the physiology of one's vocal tract. If your velum is as stiff as a board for whatever reason, then you will not be able to trill. I myself have problems at times, particularly when my throat is very dry. A little mucus will help! Can anyone, please, explain the picture by Sarah Churng to me? My mind boggles. Does the picture mean to show the articulation of a "nasalised" uvula trill? "Does the picture mean to show the articulation of a "nasalised" uvula trill?" I don't suppose it means to show any particular articulation, as opposed to just reperesenting the head of a linguist, but surely if it did it would logically by some sound in the utterance "Want to hear my uvular trill?" In Dutch? The South, cities like Rotterdam, then parts of Flemish and of Afrikaans? And some posh centenarians. Yes, I think the uvular fricative is the most common form of r in German. I think that the vast majority of English-speakers would find it easier to learn. [le:ʁɐʁɪn], at least in real life. Thanks, Lipman. Both Rs would be consonantal sounds in "Lehrerin". The question is about the vowel between the ʁs, but in this terminology, the second /r/ in [le:ʁɐʁɪn] would be both consonantal and vocalic. Only "consonantal" would be [le:ʁəʁɪn], and only "vocalic" [le:ʁɐʔɪn], I suppose. A "pick up line" is something you say to a stranger with whom you are hoping to forge a relationship. One traditional pickup line is "Do you come here often?". "I think I’d have said that the uvula (the active articulator) touches the back of the tongue (the passive articulator) rather than the other way round: but no matter." Though the uvula bounces around in the airstream, in my experience, it is the action of the tongue forming the right shape that allows the airstream to make it trill. If you "set up" to trill the uvula, you probably will feel the tongue move UP to the uvula, not the uvula dropping down to the tongue! I don't think it is "no matter" if you're trying to teach someone who can't trill! I must say that I find it MUCH harder to teach an apical trill than a uvular one. And the fact that in most cases a fricative is "good enough" means that we have an 'out' if the speaker can't manage to master the uvular trill. Apical trills don't seem to have the benefit of the alternate pronunciation as a fallback position. Question from an interested layman- which would the Edith Piaf Je Ne Regrette RRRRRien be? 1. Childhood memories from that tape I heard all the time. 2. Uvular trill (stage standard, as opposed to the regular Parisian fricative). Edith Piaf is well known for her strong uvular trill. In French, we use both trill and fricative Rs. The uvular trills people make are not as strong as Edith Piaf's. In speech, it is hard to distinguish between the two when someone is talking to you, and as trills aren't very strong, we don't notice them (as trills). But on waveforms and spectrograms, we see that both occur rather frequently. I don't get it, John Wells. OK, part of the Piaf song is in there somewhere, with half the sounds missing and nasalizations in funny places. Or are my fonts playing up? Fine here, must be the latter. @ Lance: must be your fonts. It looks perfect on my screen. These words are very prominent in my memory this week, because a choir I am in is singing Piaf's song later this week. @Eric Armstrong: "I must say that I find it MUCH harder to teach an apical trill than a uvular one. And the fact that in most cases a fricative is "good enough" means that we have an 'out' if the speaker can't manage to master the uvular trill. Apical trills don't seem to have the benefit of the alternate pronunciation as a fallback position." I have had no luck at all teaching apical trills; or my clients have had no luck learning them. But my own uvular trill, the production of which was hit-or-miss, improved immensely when I began teaching non-regional American pronunciation to an Austrian client; I asked her how she made the sound, did what she said and - hey presto! - it worked. I have since had equally dramatic results teaching uvular trills to my clients. I do tend to use a uvular fricative more often than not when speaking French, or English in a French accent, but since I can now produce a genuine trill reasonably consistently, I am no longer limited to doing so faute de mieux. Does any language distinguish these sounds phonologically, or are they 'always' in free variation? For what it's worth, I can't always guarantee to produce a trill - I think it has to do with the amount of mucus (see Kraut's comment above). My French is somewhat rusty, but I think I remember at least that much. which would the Edith Piaf Je Ne Regrette RRRRRien be? An extremely long (like, 10 contacts) uvular trill. Uvular trill (stage standard, as opposed to the regular Parisian fricative). I keep reading that. But I live in Paris most of the year now, and nobody there ever uses [ʁ]. There are some French people who do, but not in Paris. In German, /r/ isn't pronounced as a consonant in most of these positions. In other words, [ʀ] is always followed by a vowel, and therefore isn't devoiced. The uvular trills people make are not as strong as Edith Piaf's. That is, much shorter: usually a single contact, like in contemporary German. Yes, I think the uvular fricative is the most common form of r in German. I'm told by reliable sources (such as this professor of linguistics who lives and teaches in Bremen) that this is the case in northern Germany. But until recently, I (from Austria) didn't know anyone used that sound in German at all. I use a short uvular trill (at most two contacts). Probably it's even more complicated. It does seem to me that everyone who speaks Bavarian dialect uses the laminal-alveolar trill, but in Austria, where closely related dialects are spoken, at most half of the country still uses it, while the rest switched to the uvular trill generations ago. I'm still not clear on the consonantal/vocalic R point of German. For example, the word "Lehrer" is usually /le:ʁɐ/. That is a vocalic R. What if you make the word feminine in "Lehrerin"? Does it become a consonantal R? When in Germany recently, I said /le:ʁəʁin/ but I don't think that was right. I'm really not sure how you're supposed to say "Lehrerin" in German. 1) Starting from the spelling, every r changes the preceding vowel (if there is one) into a diphthong that begins with the written vowel and ends in [ɐ̯]. 2) Unstressed [ɛɐ̯] becomes [ɐ]. 3) [aɐ̯] and [aːɐ̯] consist of too similar sounds to form a diphthong and thus both become [aː]. 4) Now that the presence of r is marked (never mind rule 3...), it can disappear, and so it does, except when a vowel follows. 5) Rule 1 does not apply if the preceding vowel is long. Then it gets complicated (parts of western Germany are partially rhotic, and other parts reportedly lack rule 3), but I'll ignore that. So, ignoring the subtleties of /ɪ/ realizations, Lehrerin is [ˈleːɐ̯ʀɐʀɪn] for me, and [ˈleːʀɐʀɪn] or rather [ˈleːʁɐʁɪn] in northern Germany; Lehrer is the same without the -[ʀɪn] part. Where I come from, people have a lot of trouble imagining that the French word libération, which its unstressed short [eʀ], could at all exist; it contradicts non-northern Standard German phonology in no less than four points. Most Parisians, though not all, pronounce est with /e/ rather than /ɛ/. But I don't know if Piaf did. The French language is perhaps the most well-known example of uvular R language.This is great article about "uvular r". I liked this topic. I will surely bookmark it for future use. Good Work! Please keep going and continue.I will keep visiting this blog very often. To much information for in a very little amount of time, I'll try to get a little further information on this to clear this up for me. I am still new with this so I might be jumping ahead a little to fast. ignores the uvular trill /R/ completely and uses only the aveolar trill /r/. I was wondering whether the uvular trill /R/ had passed from current educated usage in France. Graham: "Does any language distinguish these sounds phonologically, or are they 'always' in free variation?" Uvular trills are VERY common in Dutch, anyone who says otherwise has clearly never been here. And it's not just old posh people and the South either, you hear it in Utrecht (a lot) and Amsterdam too, from young and old alike. It's a curious thing in that it seems to appear irregularly during speech, most especially when stressing words.